“Yippee,” said Margaret Geaney, wife of the farmer on whose land Crag Cave was found, when she was told about the underground discovery. 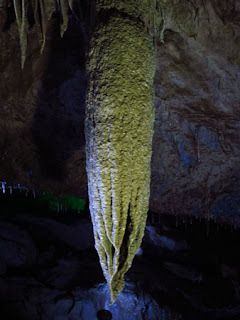 After taking a scary tour into the undeveloped cave herself (“My heart was jumping so much I thought I’d never get out,” she said), Geaney realized this was a natural creation of immense beauty that should be opened for public viewing. Even though she was excited about the prospect, extensive research and construction had to be done before that could happen. 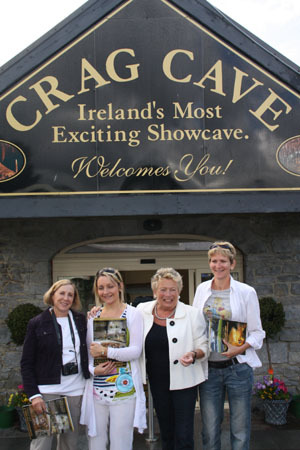 Crag Cave, is second from right. There are five limestone cave systems in Ireland that are open to the public, and they are continually subject to erosion from water. Crag Cave in the Sliabh Luachra area, was formed from millions of years of shell and bone deposits, earth movements and upheavals, and volumes of water that carved out a dark maze of passages and unusual formations. How the cave was discovered is another of nature’s amazing stories. As far back as the mid-1800s, geological surveys recognized the existence of a network of caves in the Castleland district in southwest Ireland at the entrance to Dingle peninsula. But there was never any exploration until water pollution in the area forced an investigation. In 1983 cave divers were trying to determine the source of a particular stream when they discovered a pool and dived 20 feet down to explore. That was the beginning of Crag Cave. More expeditions led to additional discoveries of the cave’s many decorated passages and chambers. When Geaney’s husband, the local doctor, bought the farm he put it in her name. She was happy to become involved in the project, and accepted the offer of one of the original cave divers who helped with the development. Work began in 1987, and 350 meters was opened to the public in 1989. Special lighting was designed to create a visual and aural landscape without distracting from the cave’s natural attributes. 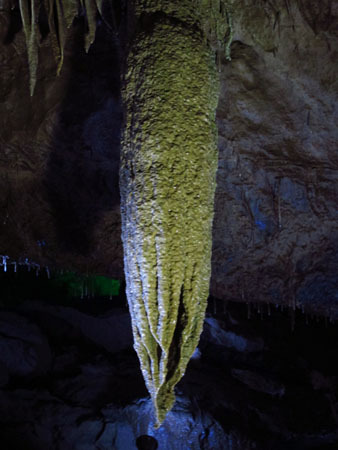 Far underground, stalagtites and stalagmites join to form columns. Creations like Corn on the Cob, The Kitchen, Theodens Road, and The Cathedral enthrall visitors. The Crystal Gallery is an especially enchanting area, and most people are amazed at the likeness of one specific formation in the distance called Madonna. A gift shop, café, and children’s playground add to the amenities. As with other limestone caves, Crag Cave is a work in progress; it will continue to change with the elements. For now, it’s a lovely spot to put on your itinerary if you’re visiting Dingle peninsula and Ring of Kerry, well-known destinations on Ireland tours. Read more stories from my trip to Ireland at Striped Pot.